The celebration of the 50th wedding anniversary of J.M. and Susanna Wolford Isenberg brought 4 generations of the Isenberg family together. 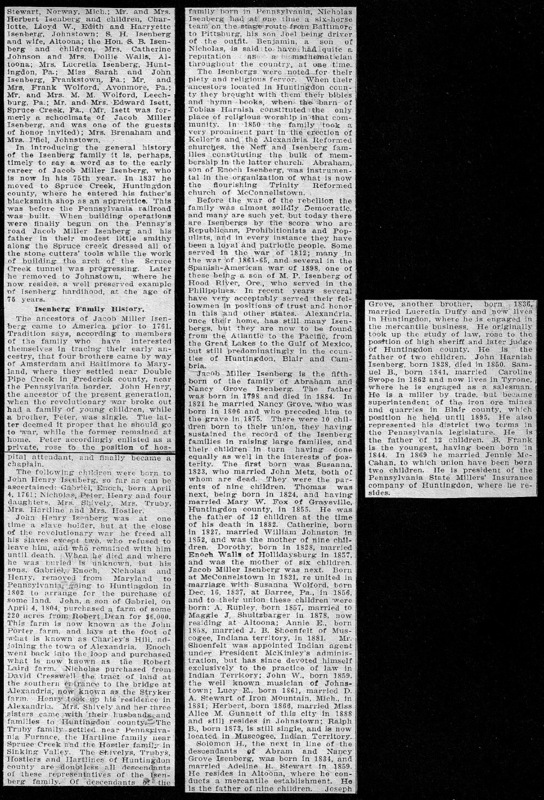 Below is the newspaper (not named) article printed the next day May 18, 1906, describing the event. Yesterday witnessed one of the most elaborate golden wedding celebrations ever known in the history of Johnstown. Fifty years ago Jacob Miller Isenberg and Susanna Wolford Isenberg of 127 Strayer Street, Dale Borough, were united in marriage by the Rev. Dr. Frederick A Rupley, pastor of the Reformed Church of Martinsburg, Huntingdon County, and the occasion of their 50th wedding anniversary was one that will be entered in the annals of the history of the Isenberg family, now being annually compiled by representatives who have traced their ancestry from an early date to the present generation. Golden weddings galore have been celebrated in Johnstown and its surrounding vicinity, but it is doubtful if ever an event of this kind called representatives of the family tree from a wider field than was represented yesterday. Preparations for the event had been in progress for the past several days, and no pains were spared to make it one of the most elaborate in the long history of the Isenbergs. All day yesterday the green lawn at the Isenberg home shone resplendent under a canopy of canvas where four generations of the family of Jacob Miller and Susanna Wolford Isenberg made merry amid the festivities of the day. When the noonday hour arrived the family, which represented almost exclusively, with possibly one or two exceptions, the descendants of Mr. and Mrs. Jacob Miller Isenberg, sat down to a scrumptious repast upon tables constructed on the lawn for this special occasion. Preceding the meal, the Rev. Mr. Mickley, pastor of the Reformed church of Johnstown, who with his mother, constituted two of the guests of honor, delivered a very able address in honor of the occasion., Responses were made by the Hon R.B. Isenberg and Solomon Isenberg of Altoona, the latter reading to those assembled a brief history of the Isenberg family and its descendants down to the present generation. After dinner music was furnished by an orchestra composed of members of the Isenberg family, assisted by Bernard Wolfhope, the well-known Johnstown musician. Last evening the lawn again presented a merry scene. Japanese lanterns were hung here and there. Gasoline jets reflected the happy expression on dozens of Isenberg faces, while Otto Sann’s Concert band, hemmed in by a border of bunting intermingled with the national colors, discoursed music that swelled on the breeze and drew many a resident of the quiet little borough of Dale to the outside margin of the Isenberg lawn to observe the festivities and listen to the music. It was something entirely different from anything Dale borough had ever before seen in this line. 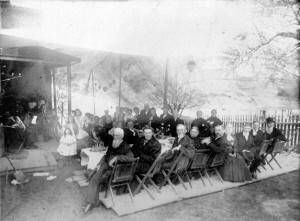 Refreshments were served during the evening. 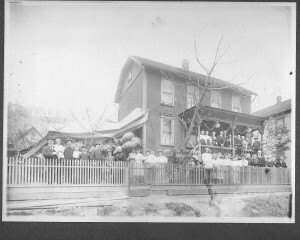 The following is the list of those present at yesterday’s ceremonies, representing four generations of the family: Mr and Mrs. Rupley Isenberg and children: Edna, Ethel, Fred G and Bruce M Isenberg from Altoona; Mrs J.B Shoenfelt and children Mrs. Claud Thompson, Frances Thompson, a granddaughter and Doris Shoenfelt, Muscogee, Indian Territory; John W. Isenberg, musician, Johnstown; Mrs. Dan Stewart and children, Grace and Dora Stewart, Norway Mich; Mr. and Mrs. Herbert Isenberg and children, Charlotte, Lloyd W, Edith and Harrette Isenberg, Johnstown; S.H. Isenberg and wife, Altoona; the Hon S.B. Isenberg and children, Mrs. Catherine Johnson and Mrs. Dollie Walls, Altoona; Mrs. Lucretia Isenberg, Huntingdon PA; Miss Sarah and John Isenberg, Frankstown, PA; Mr. and Mrs. Frank Wolford, Avonmore, PA; Mr. and Mrs M.M. 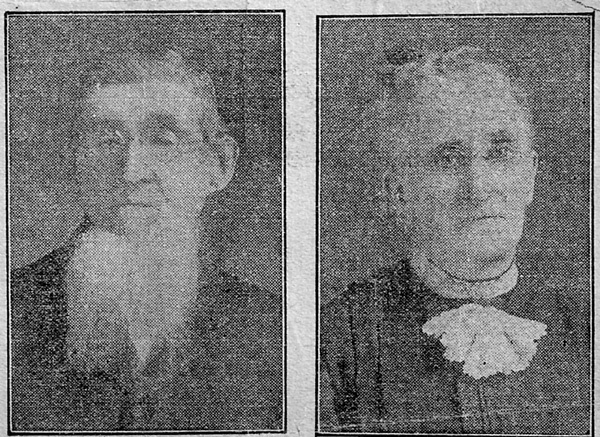 Wolford, Leechburg, PA; Mr. and Mrs. Edward Isett, Spruce Creek, PA (Mr. Isett was formerly a schoolmate of Jacob Miller Isenberg and was one of the guests of honor invited): Mrs. Brenaham and Mrs. Pfiel, Johnstown. In introducing the general history of the Isenberg family it is, perhaps timely to say a word as to the early career of Jacob Miller Isenberg, who is now in his 75th year. In 1837 he moved to Spruce Creek, Huntingdon County, where he entered his father’s blacksmith shop as an apprentice. This was before the Pennsylvania railroad was built. When building operations were finally begun on the Pennsy’s railroad Jacob Miller Isenberg and his father in their modest little smithy along the Spruce creek dressed all of the stone cutters’ tools while the work of building the arch of the Spruce Creek tunnel was progressing. Later he removed to Johnstown, where he now resides, a well preserved example of Isenberg hardihood, at the age of 75 years. The ancestors of Jacob Miller Isenberg came to America prior to 1761. Tradition says, according to members of the family who have interested themselves in tracing their early ancestry, that four brothers came by way of Amsterdam and Baltimore to Maryland, where they settled near Double Pipe Creek, in Frederick County near the Pennsylvania border. John Henry, the ancestor of the present generation, when the revolutionary war broke out had a family of young children, while a brother Peter was single. The latter deemed it proper that he should go to war, while the former remained at home. Peter accordingly enlisted as a private, rose to the position of hospital attendant, and finally became a chaplain. The following children were born to John Henry Isenberg** (see note below), so far as can be ascertained; Gabriel, Enoch, born April 4, 1761; Nicolas, Peter, Henry, and four daughters; Mrs. Shively, Mrs. Truby, Mrs. Hartline and Mrs. Hostler. John Henry Isenberg** was at one time a slave holder, but at the close of the revolutionary war he freed all his slaves except two, who refused to leave him and who remained with him until death. When he died and where he is buried is unknown, but his sons, Gabriel, Enoch, Nicholas and Henry removed from Maryland to Pennsylvania, going to Huntingdon in 1802 to arrange for the purchase of some land. John, a son of Gabriel, on April 4, 1804, purchased a farm of some 220 acres from Robert Dran for $6,000. This farm is now known as the John Porter farm, and lays at the foot of what is known as Charley’s Hill, adjoining the town of Alexandria. Enoch went back into the loop and purchased what is now known as the Robert Laird farm. Nicholas purchased from David Cresswell the tract of land at the southern entrance to the bridge at Alexandria, now known as the Stryker farm. Henry took up his residence in Alexandria. 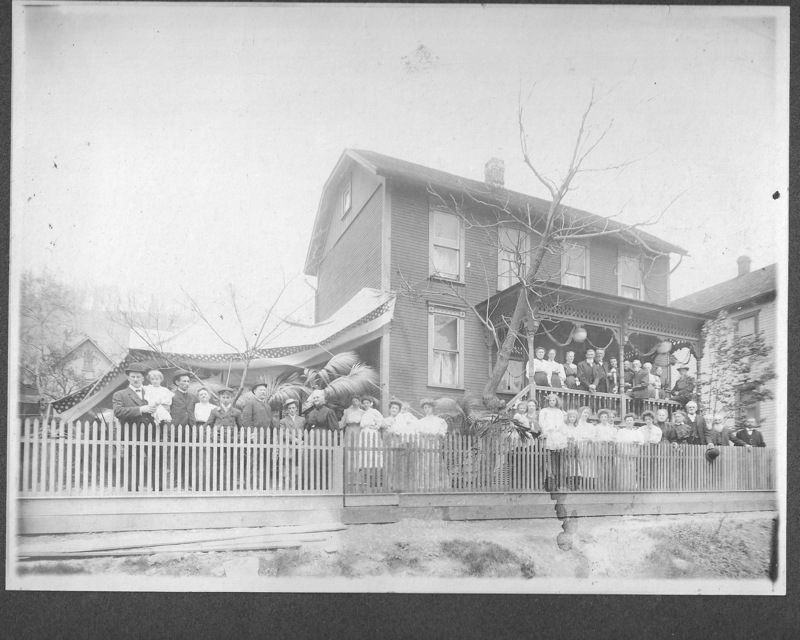 Mrs. Shively and her three sisters came with their husbands and families to Huntingdon County. The Truby family settled near Pennsylvania Furnace, the Hartline family near Spruce Creek and the Hostler family in Sinking Valley. The Shivelys, Trubys, Hostlers,and Hartlines of Huntingdon county are doubtless of the Isenberg family. Of descendants of the family born in Pennsylvania, Nicholas Isenberg had at one time a six-horse team on the stage route from Baltimore, to Pittsburgh;his son Joel being a driver of the outfit. Benjamin, a son of Nicholas, is said to have had quite a reputation as a mathematician throughout the country at one time. The Isenbergs were noted for their piety and religious fervor. When their ancestors located in Huntingdon they brought with them their bibles and hymn books; then the barn of Tobias Harnish constituted the only place of religious worship in that community. In 1850 the family took a very prominent part in the creation of the Keller’s and the Alexandria Reformed churches, the Neff and Isenberg families constituting the bulk of membership in the latter church. Abraham, son of Enoch Isenberg was instrumental in the organization of what is now the flourishing Trinity Reformed of McConnellstown. Before the war of the rebellion the family was almost solidly Democratic and many are such yet, but today there are Isenbergs by the score who are Republicans, Prohibitionists and Populists, and in every instance they have been a loyal and patriotic people. Some served in the war of 1812; many in the war of 1861-1865, and several in the Spanish-American war of 1898, one of these being a son of M.P. Isenberg of Hood River, Ore, who served in the Philippines. In recent years several have very acceptably served their fellowmen in positions of trust and honor in this and other states. Alexandria once their home, has still many Isenbergs, but the y are now to be found from the Atlantic to the Pacific, from the Great Lakes to the Gulf of Mexico, but still predominately in the counties of Huntingdon, Blair and Cambria. Jacob Miller Isenberg is the fifth born of the family of Abraham and Nancy Grove Isenberg. The father was born in 1798 and died in 1884. In 1821 he married Nancy Grove, who was born in 1806 and who preceded him to the grave in 1875. 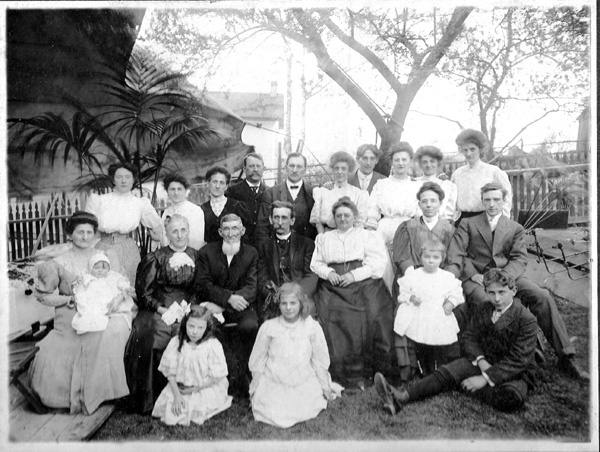 There were 10 children born to their union, they having sustained the record of the Isenberg families in raising large families and their children in turn having done equally as well in the interests of posterity. The first born was Susanna 1828 who married John Metz, both of whom are dead. They were the parents of nine children. Thomas was next being born in 1824 and having married Mary W Fox of Graysville, Huntingdon County in 1855. He was the father of 12 children at the time of his death in 1882. Catherine born in 1827 married William Johnston in 1852 and was the mother of nine children. Dorothy, born in 1828 married Enoch Walls of Hollidaysburg in 1857, and was the mother of six children. Jacob Miller Isenberg was next. Born at McConnelstown in 1831, he united in marriage with Susanna Wolford born December 16, 1837 at Barree, PA. In 1856 and o their union these children were born; A Rupley, born 1857 married to Maggie J. Shultzabarger in 1878, now residing in Altoona, PA; Anne E, born 1858 married J.B. Shoenfelt of Muscogee, Indian Territory, in 1881. Mr. Shoenflet was appointed Indian agent under President McKinley’s administration, but has since devoted himself to the practice of law in Indian Territory ; John W, born 1859 the well-known musician of Johnstown; Lucy E, born 1861 married D. A. Stewart of Iron Mountain, Mich in 1881; Herbert, born 1866, married Miss Alice M. Gunnett of this city in 1888 and still resides in Johnstown; Ralph B, born 1873, is sill single and is now located in Muscogee, Indian Territory. Solomon J, the next in line of the descendants of Abram and Nancy Grove Isenberg was born in 1834 and married Adeline B. Stewart in 1859. He resides in Altoona, where he conducts a mercantile establishment. He is the father of nine children. Joseph Grove, another brother, born 1836 married Lucretia Duffy and now lives in Huntingdon where he is engaged in the mercantile business. He originally took up the study of law, rose to the position of High Sheriff and later Judge of Huntingdon County. He is the father of two children. John Harnish Isenberg, born in 1838, died in 1850. Samuel B., born 1841 married Caroline Swope in 1862 and now lives in Tyrone where he is engaged as a salesman. He is a miller by trade, but became superintendent of the iron ore mines and quarries in Blair County, which position he held until 1895. He also represented his district two terms in the Pennsylvania legislature. He is the father of 12 children. B. Frank is the youngest, having been born in 1844. In 1869 he married Jennie McCahan, to which union have been born two children. He is president of the Pennsylvania State Millers Insurance company of Huntingdon, where he resides. Below are links to the original article, but it is too hard to read in the original condition and so transcribed here. **Journalists even in 1906 didn’t get their stories quite right; John Henry (Heinrich) Isenberg born in 1753 in Berks County, was the son of Gabriel 1720 and Maria Eva. 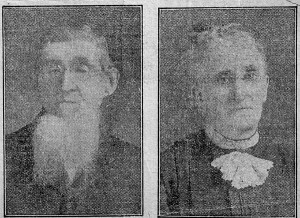 The children listed in this article above appear to be Gabriel’s children, including John Henry. Only Two of the daughter’s married names match. Our family record indicates that the father of Gabriel (and Simon) was Enoch Isenberg 18 Jul 1689 wife (Schwedner or Beber). Will update as information becomes available.